Ujjain as an ecclesiastical unit in India came into existence when the ?Apostolic Exarchate of Ujjain? was erected by Pope Paul VI on 29th July 1968 with the papal bull ?Apostolicum Munus? and entrusted it to the newly formed Missionary Society of St. Thomas the Apostle. 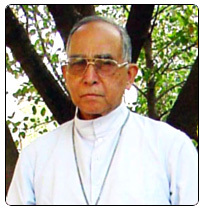 Father John Perumattam, the first Director General of the Society was appointed the Apostolic Exarch of Ujjain and he was installed as the Exarch at Ujjain on 14th January 1969. The Exarchate of Ujjain was created by bifurcating the diocese of Indore. The three civil districts of Ujjain, Shajapur and Rajgarh formed the new ecclesiastical unit. The Apostolic Exarchate of Ujjain was erected as the Eparchy of Ujjain on February 26, 1977, by Pope Paul VI of happy memory with the Apostolic Letter ?Qui Divino Consilio? and appointed Msgr. 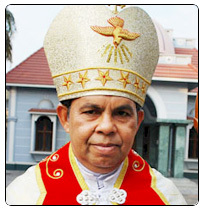 John Perumattam as its first Bishop. On 5th June 1998, Holy Father accepted his resignation and Father Sebastian Vadakel was nominated the second bishop of Ujjain. He was consecrated bishop on 8th September 1998 and he took canonical possession of the See on the same day.